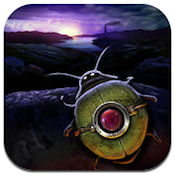 Help Volty is a wonderfully atmospheric iPad game developed by Tvndra Producties. While it does have some minor issues, Help Volty is great title that is definitely worth checking out: it feels far more expensive than it costs. Here’s the set up: “The wanderer came upon a dark town. There he met a silent merchant with a peculiar wooden box. 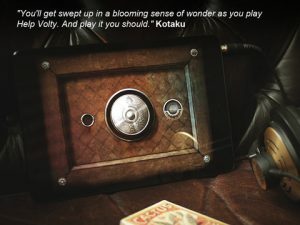 Inside he had built a cruel game with gears, knobs, wires… and Volty.” What is Volty? You’ll just have to play to find out, because this game is so wonderfully immersive and engaging that I hesitate to spoil even a minute of it for you. Suffice it to say that Help Volty will introduce you to an adorable little bug, a mechanical creature that you need to help navigate the twists and turns of a seriously cool puzzle box. 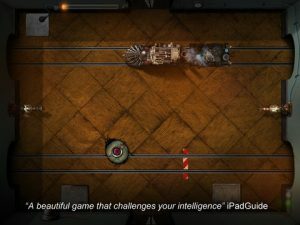 But beware: some puzzles have enemies hidden within that will ensnare you. A couple of issues: firstly, the lag time between environments. While it wasn’t atrocious, the load time between one environment and the next was just long enough to be annoying. Also, I had an issue with getting sounds and music to load during gameplay. But all that stuff can be overlooked because of the great, responsive controls. With such fine-tuned controls, I was astonished when I read that this is the very first game that Tvndra has released. The whole gameplay experience with Help Volty just feels expensive and captivating. 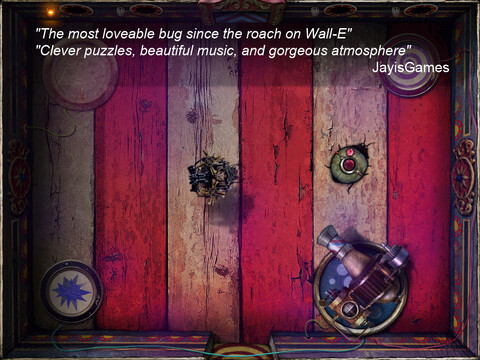 It’s a great diversion for both serious and casual gamers alike. There’s a lot of crap on the App Store. Help Volty is absolutely worth your time, and your money. If you only download one new iPad puzzle game this month, make sure it is Help Volty. 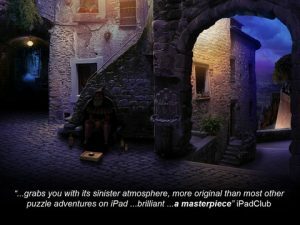 For what you pay, you get a game with immense replay value, and one of the most lovely game designs of any iPad game out there. Come for the puzzles, stay for the one-of-a-kind gaming atmosphere. Help Voltyis compatible with iPad. Requires iOS 4.0 or later.